It is funny the way life turns out. At the same moment that I am writing about how much these children need loving parents, some loving parents were helping me. Although I have already thanked you personally, I just want to thank you all again. An especially big asante sana to the Kristopher family, the Bossler family, the Martin family, the McKeehan family, the Schiff family, the Frels family, the Anastos family, the Lenihan family, the Benjamin family, the Scott family, the Lacke family, the Pagano family, the Elert family, the Hettinger family, the Pelc family and the Partain family for your garage sale benefit to help me. It was such a heartfelt gesture and incredible surprise. I am still stunned. You all are the reason that I am here in the first place and I feel more and more blessed every day to know you. Though the children are enough daily encouragement, it is knowing that you all support me that keeps thinking of more and new ways to help the children. Without your help I never would be here and you all continue to support me so much. You are responsible for any good I do here and I think and pray for all of you all always. Not enough can be said about the example you all provide for me and others. Like I said before, when I grow up I want to be just like you :). Now a fun story for you…This weekend we had a special event at our hotel, a wedding reception! Though I initially thought I would be working it as a bartender, I was a last minute invite to it, or so I thought. When the guests for the wedding reception started arriving Mama Shayo (our headmistress and wedding attendee) eagerly found me. She then told me “You go in now with her” and handed me an invitation. I was a bit confused by her rushing me in right then with a beautiful young African woman but I found a seat and the wedding reception began shortly after. As I sat there I opened and read the invitation and on the inside. It said welcome “Mr. Terry and Marta” and that is when I realized… I was her date! At that point everything made sense, why Mama Shayo grabbed me, why everyone was staring at me and why this young woman knew my name before I ever met her. For the last couple years everywhere I go people introduce me to their daughters, nieces, friends and everyone in between so that I will “find a nice girl, get married and stay in Tanzania”. The mamas at the school are especially guilty of this. Of course (no worries mom and dad) I am the quintessential gentleman, so I had a wonderful time chatting with my new friend/date Marta. This was the fifth wedding reception that I have attended in Tanzania so I knew what to expect, but I still found myself laughing and a bit in awe at certain points. First the music began which was a mixture of brass instruments outside and DJ music inside. Somehow everyone found a beat and began to clap and dance on their way to the seats. The whole family, about 50 people, walked and danced on the way in to lead in the newly married couple. As the new couple stepped inside to the wedding reception hall I noticed two lizards scurry up the wall. I don’t normally notice lizards anymore, because they are everywhere, but I wondered how many new American brides would be totally ok with lizards running around the walls of their wedding reception hall? I have to think that lizards might be a deal breaker for most people when considering a wedding reception hall. After everyone was inside, they began the many speeches of the family members offering advice, sometimes very personal advice to the new couple (luckily for me I had Marta there to translate them for me). After about an hour of talking and speeches it was time for the cake. Of course when I say cake at a Chagga wedding I mean mbuzi cake. One important element to most weddings here, especially a Chagga tribe wedding (as this one was) is “mbuzi” which is goat. This barbequed goat is also brought down in a procession of music and dancing. So the chef, family and wedding planners all danced while spinning and pushing a cart carrying a big barbequed goat with an apple and leaves stuck in his mouth. Picture a pig on a spicket sort of roasting with lots of dancing and music. They brought the goat right up in front of the stage, in the middle of everyone and the chef began slicing off pieces. This then leads to the bride and groom hand feeding the pieces of goat to the family and special guests which of course being the only white guy there I was a “special guest”. There are few experiences that compare to being hand fed goat on a toothpick in Africa. One by one we filed up dancing and clapping to receive the goat. Luckily with everyone watching I didn’t drop the piece or choke on it, although it was quite chewy and a bit hairy. After eating dinner comes the gift giving which of course is done by, you guessed it, a dancing procession. There are typical gifts of money, cloths (called Kangas and Kitenges) and other items. They call up the different groups of people; family, friends, coworkers and everyone else, but the absolute best gift given was a goat. My favorite part was when they danced the entire way while carrying the goat to the couple! It was quite a sight to see, a whole family dancing around one man, who was still wearing a suit and tie swinging and dancing carrying a goat right into the middle of a wedding reception. I of course had no gift (certainly no goats) but instead stuffed some cash into an envelope. By this time I had drawn a fair amount of attention (due to my whiteness) so when I came up to hand my gift Mama Shayo grabbed the microphone and began talking to the people. She explained that I was her son and I was here to teach the children of Stella Maris. After a nice speech she handed the DJ/host who then asked me in English what is your name and where do you come from. Figuring it was my best chance to actually introduce myself I said “Jina langu ni Massawe, ninatoka Kibosho” which means “My name is Massawe (a common Chagga tribe name) and I come from Kibosho (The heart of Chagga tribe land). The entire wedding went from stunned to laughing hysterically. They all stood up, danced and shook my hand on the way back to my seat, even though they were probably more confused than ever who I actually was. There is nothing like African hospitality. After the reception had ended we all stood outside together and said goodbye. Even the goat was outside tied to a pole chewing on our grass around the hotel. Many people came up to me, thanked me for coming, helping and then congratulated me. Then they would talk to Marta laugh, hug her and congratulate her. After about two dozen different people saying “hongera” which means “congratulations” I asked Marta why they would congratulate me when I was just attending a wedding. She then told me “because they think you are my fiancé. They think we are getting married and I am going to America with you.” Don’t worry though, I will give you all a heads up before I get married. Although a destination wedding does sound pretty awesome, keep checking your mailbox for the invitations. Thank you again to the incredible families from St. Joseph who continually inspire me with their generosity. I love you all. Thank you everyone and God bless! There are so many things that I would like to focus this entry on, but one stands out amongst the rest. I must first apologize for the delay, I have been dealing with the local nightmare known as the Government and immigration…but I won’t bore you with all of that! The children are doing great which is of course the best news possible, but the thing that is most on my mind is our school meeting. We held a school meeting on Wednesday and had been talking about if for at least a month. With announcements daily to the children, contacting the community and announcements in church we were excited for the opportunity to speak directly to the parents and guardians for the children. It was at 9 a.m. on Wednesday which is actually the ideal time and day here because the parents could arrive early and still have time to work after and take care of their homes. So Fr. Kitali, Mama Shayo, Madam Gonda and I all anxiously awaited the parents. At 9 a.m. we had 1 parent and by 9:05 we had a total of 4. One big difference of “time” here is that people are always late, all the time, to everything. In fact I was at a wedding one time that started an hour and a half late because they were waiting for people and no one even batted an eye. So together myself, the teachers and Fr. Kitali waited, for an hour until we couldn’t wait any longer. We had less than 50 parents or guardians at that point, but we had waited long enough. On our end the meeting went well; we discussed school policies, expectations and most importantly what we needed the parents to do at home. We have been noticing a disconcerting trend of our children not being cared for at home. Most notably they were coming to school dirty, late and having not completed any homework. This happens all the time, but lately it seemed to be getting worse. We want the parents to be invested in their children and value them unfortunately we are fighting an uphill battle. With 116 pupils, I was certainly expecting more than 50 adults to show up to a meeting set at their desired time (especially considering we waited for an hour for them to show up). Not surprisingly the parents that we need most to show more involvement in their children did not even bother to attend the meeting. It is a sad truth that children are often not valued here nor cared for. That includes our children at Stella Maris that we all love so much too. However on a day that could have been a complete disappointment there was one positive outcome. The adults that did show up were frustrated as well. They spoke out about people showing up late (kind of awkward because they were forced to sit in the front closest to us, the 4 Stella Maris representatives) but most of all they were upset at their neighbors and friends that didn’t bother to show up. They see the other children walking to school dirty and know that others haven’t done anything for the children in their care. The word that Mama Shayo always uses is "contribute" and it is a struggle to get the parents or guardians to contribute to their children. Our only hope of reaching these adults now is through the community and my prayer is that it mobilizes them to begin to do more for the children. Hopefully the glares and disappointment of their neighbors will be enough to urge them forward. We are in an incredible position here to do something tremendous for this community and these children. I am also reminded of how blessed we are in our communities especially our local communities such as St. Joseph that we have such strong parents that care about our school. You can not realize how much a parent does for a child until you see a child without one. I see the evidence of what not having loving parents does every day, and also the incredible change in confidence and body language a smile and a warm greeting does for these children. Our role at school is big, but not big enough. Our impact is limited by the simple fact we have to send the children home everyday. Please keep these families in your as we hope they can find room in their lives and hearts for their children. We know that at least for 8 hours a day we provide them with a safe haven and also act as an example of what love is. I just want to say thank you to my parents and all of you parents that do so much for their children. I miss very much the impromptu parent teacher conferences, countless emails, calls and all of you parents that kept me late at school. You are welcome here anytime, many of our children need you. This week marked the beginning of the third and final trimester of the school year at Stella Maris. I’ll tell you what, it was pretty great to be back in the classroom with all the children. The semester does begin with many changes. For the first time I will have a fellow teacher from America Adam Archer, here for the whole term (and half of next year too) to work with and teach the children. Adam is with our new all-star of a teacher Juliana Kway working hard in P1. He will also be helping in his own expert field of Social Studies. Juliana has been working hard for the past few months to get the P1 students ready for P2, but with 44 students in the classroom, it definitely will help to have someone to co-teach with. Adam taught high school Social Studies in America, so it also makes perfect sense for him to bring some of his skills into that field for our students at Stella Maris, most notably in History and Civics. It is a real blessing to have him with us and I definitely appreciate having another American guy around to work with and talk about football. As for me I am taking back my original students from years ago now in P3, as well as taking P2 and helping when I can in P1 when I can. Most of my focus for the next few months will be English and Math though. The one class Mama Shayo decided was my highest priority was P2. “They are not good right now” she said to put it nicely. For whatever reason they have been running rough shod over the instructional time and struggling especially in English. Most likely because they were bored in class, lacked structure and were struggling with the language barrier. The first day of the new term I said my piece to the P2 students about my expectations in class and then began to follow through. One of the funniest misconceptions about young children in Africa is that they are perfect little students. They do look forward to school and they are thankful, but they do not sit perfectly and quietly. They are children. Children are children, no matter where they are from. If their friend talks to them, they want to talk and if someone is playing, then they want to play. Of course in a class of 35 this can happen an awful lot. Nevertheless I use the same behavior strategies I do in America; I compliment those who are doing the right thing to remind everyone else of what they should do. I have always found I preferred to be around people who are kind and good hearted, and I don’t think that is unique. I also recognize that I would much rather work hard for someone I cared about and who cares about me. So if a classroom is a happy place, with a teacher who cares, then the children will want to be in the classroom working together. This of course is completely crazy to the teachers here who are taught more “old school” methods of behavior management. Luckily for me after years of being together they just let me do my thing. After a few days the children were already doing better, they realized that they didn’t want to have to stand outside or sit away from everyone and that my expectations were not changing day to day. Before every lesson I reviewed my expectations “We are going to keep our ears open to listen, our mouths will only talk English, and we will raise our hands when we want to share”. After a few days I realized I left out the most important part of my role in the classroom. I then told my students “I want you all to do well today because I love you and know you can do well.” Love is the reason why I am here, the reason why I teach and most of all it is the reason for this school. They deserve to know I love them no matter what and they should hear it every day. By the end of the week they had mostly figured it out, they sat quietly, raised their hands without talking and were working harder than before. I know there will be lots of hard days. They will test me, talk while I am talking, forget to raise their hands, play while I teach, and not perform as well as I hope on examinations, but it is a start. For two whole lessons on one day I could look at the students and know that we all understood why we were in the classroom together. I am here to teach them because I love them and they are here to learn. The truth is I didn’t become a teacher because I always wanted to teach, I became a teacher because I wanted to help children who needed me. It just so happens that teaching was the best way for me to do that. I also didn’t plan on teaching in Africa, but I found an extraordinary opportunity and challenge in Tanzania, so here I am again. I was not a good kid in school, I talked all the time, never listened and got into plenty of trouble. I even sat alone starting in first grade because my teacher gave up on me in the first two weeks because I wouldn’t stop talking. It’s the children that talk too much, play too much or just need someone to show them a little more attention that are the ones I relate too. What is most incredible about Stella Maris is that we have 116 students that need someone to be that “little more” for them almost every day. They may have missed a couple meals, had a tough time at home, slept on the ground, been ignored or just need a little bit of love. 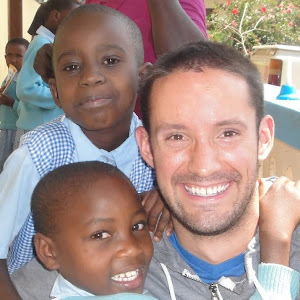 It is being that person they can count on that brings me so much joy teaching in whether I am in America or Tanzania. Teaching is challenging, draining and motivating all at once especially with 116 high need students. Now with a new semester upon us and a great challenge ahead I can honestly say I could not be more excited. I’m excited because I get to be the example, to be that person they can count on to be loving and caring every day so that these children know how special they are. response to my last post. I really appreciate all the kind words of encouragement. I really do thank all of you who are so positive and supportive of me. You will never know what it means to me, but understand it is your example of love that I am trying to spread. Thank you all and God bless.